If you are considering getting a walk-in safety tub for either yourself or a family member it is a good idea to have an in home consultation. This is generally a free service offered by companies that sell and install walk-in tubs offering expert advice. However, if this is not possible you may find the information below helpful. Walk-in tubs are not stand up showers! A walk-in tub is a freestanding unit and not meant to be built-in like a standard tub. The reason they are placed into existing tub cavities is because in almost every case, it’s the only practical place for them. Tub/shower conventional tubs are the most common in homes and can be used for both. They have a flange which is attached directly to the wall studs covered with the shower board & tile which makes them practical for bathing and showering, but they become very difficult for people with mobility challenges to use. 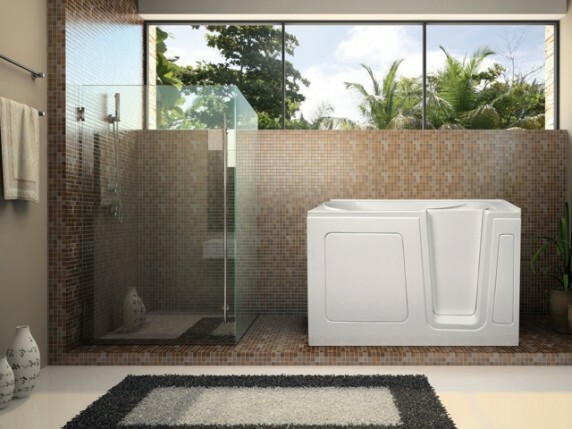 Walk-in tubs have limited space when standing because of the molded in seat, but are perfect for people who enjoy primarily bathing and don’t mind rinsing off while they remain in a seated position. 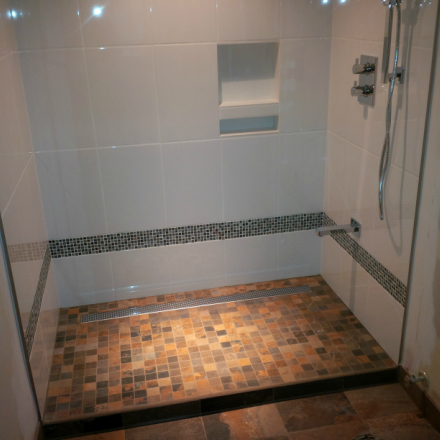 People who prefer stand up showering or require care giver assistance may want to look into accessible shower options. There is a number of things to keep in mind when choosing the size of a walk-in tub. The most popular sizes in walk-in tubs do not hold any more water than a standard tub, but unlike a standard tub a walk-in tub fills while you are inside of it. This is an important factor in choosing the appropriate size tub. Walk in tubs generally are shorter in width than a standard size tub, but higher to allow the bather to sit down as if in a chair but still get a deep soak. If a tub is too wide, not only will it take longer to fill using more water than is necessary, but drain time will be longer. This has to do with the amount of water the bather’s body will displace. A tub too large can also put a strain on a hot water tank and an upgrade may be required. For a close approximation of water displacement use one gallon for every ten pounds of body weight. 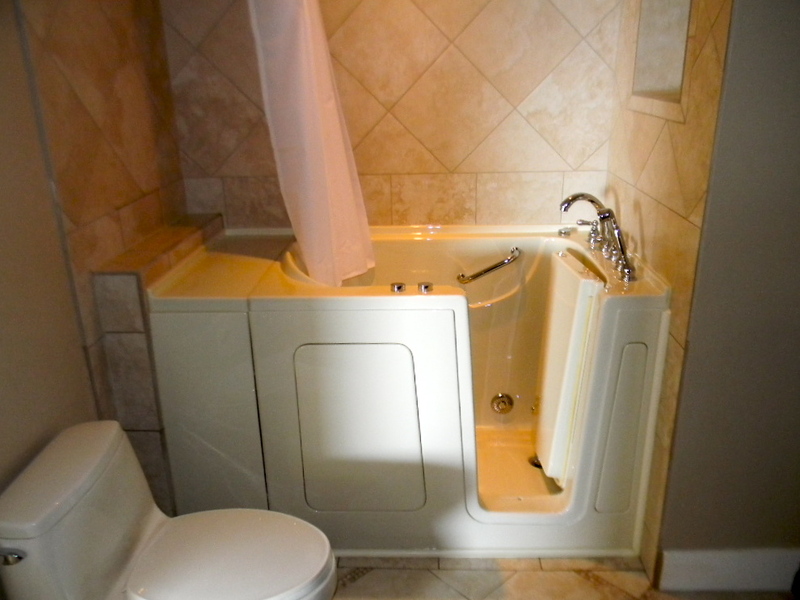 For instance, let’s say a walk-in tub has the capacity to hold 45 gallons of water. If the bather weighs 150 lbs. then he or she will displace approximately 15 gallons of water, therefore it would take about 30 gallons of water to fill this tub to have a full soak bath. Did you know 85% of Walk-in Tub sales & installations will have inward opening doors, and be one of three sizes. Size is also very important during installation. 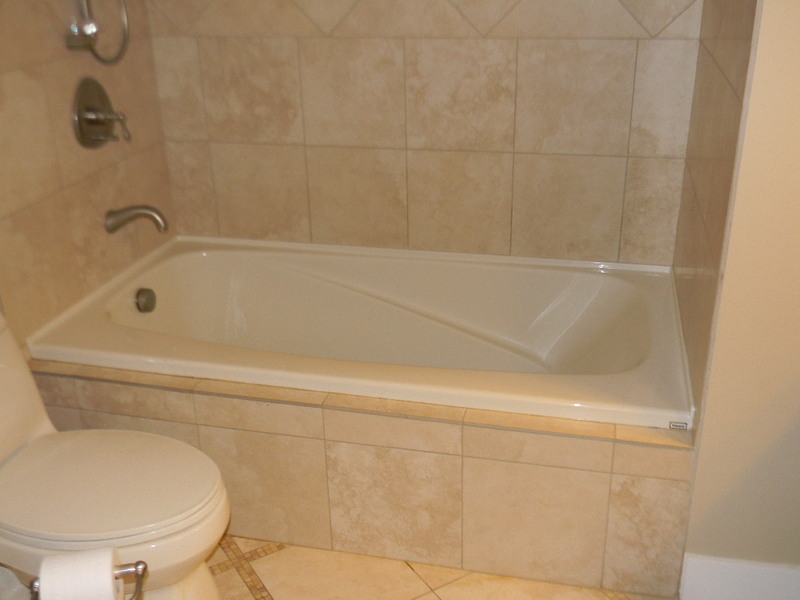 Most walk-in tubs are installed into existing bathrooms. This requires the existing tub, generally installed during construction before most of the finishing and possibly some interior framing was completed, to be removed and the walk-in tub to take its place. Walk-in tubs have always been offered in different sizes but some manufactures are starting to increase the width to near standard tub size measurements and they are not practical for retrofitting an existing bathroom. 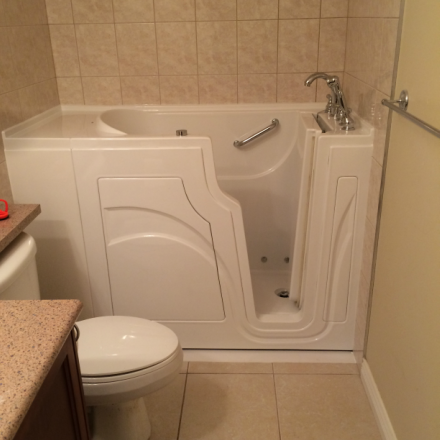 Here is some things to consider concerning the installation of walk-in tubs. Industry standard size tubs are 30”X 60” but are lighter than walk-in tubs, and easier to maneuver. The height of a standard tub is around 15-16 inches, so although a standard tub is just under 60” in width and 30” in depth it can easily slip through a bathroom door on its end and sideways. Walk-in tubs are much heavier and are more difficult to move around. They come in depths starting from 26 inches up to 35 inches, heights starting at 37 inches up to 42 inches, and widths from 47 inches to 60 inches. Let’s consider the depth measurement first. Unless wider doors were installed in a home, the standard interior door is rough framed to a 32” width but can be narrower. Then the door jams, or a pre-hung door is installed and the width is reduced to about 29.5 inches or less. Removing the casings and door jams or a pre-hung door, then replacing them is a simple procedure. However, if removing 2X4′s or steel framing is necessary to allow a tub to pass through, it could mean dry wall repair and painting, or wall paper could be damaged. The moving of electrical switch boxes may be necessary. 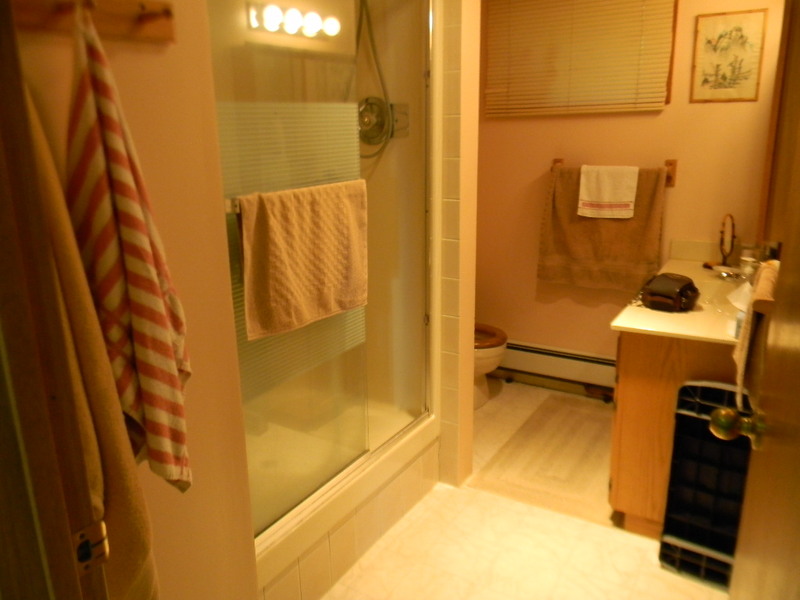 The bathroom vanity might be in the way and be required to be temporarily removed. The width of a tub can also add to the difficulty of installation. A tub too wide is harder to get through hallways, turn into a door openings, and much more difficult to fit into place and plumb into the existing drain due to lack of work space, particularly when a bathroom is the same or only slightly wider than the tub being installed! Important: If you have to turn a tub end to end inside the bathroom to fit into the tub cavity, your bathroom must be wider that the diagonal measurement of the tub or opening up walls will be required. Attempting to install too large of a walk-in tub into an existing bathroom can be very challenging. Walk-in tubs are designed to offer more bathing room and are like older style standard steel or cast iron tubs in this regard. For instance, an older standard bathtub with an exterior depth measurement of 3o inches will be a full 23 inches inside, and this measurement would continue down to the bottom of the tub giving the bather plenty of room. Newer standard tub designs tend to be narrower and taper in towards the bottom of the tub. There will be bathers who will require walk-in tubs 32 – 35 inches in depth and 55 – 60 inches in width, but walk-in tubs up to 30 inches or less in depth and 52 inches or less in width will be more than adequate 90% of the time, and if you feel you require more space think about adding height first. How long does it take to drain a walk-in tub? The same amount of time a regular tub takes to drain, except you need to wait until this happens before exiting. The standard tub drain and p trap is 1 1/2″. The p trap is plumbed into the main sewer drain. Gravity and a 1 1/2″ tub drain will only allow so much water through it regardless how many holes are drilled in the bottom of a tub. You could increase the diameter of the p trap and drain going to the larger waste line, but unless the work is easily accessible, plumbing costs and repair likely wouldn’t make it practical. Optional Quick Drain technology offered by some distributors will come with a disclaimer because they have the potential to cause damage to drains and p-traps. A home’s drainage is made up of series of pipes, glue joints, and rubber couplings, all well suited for naturally vented drainage. An electric water pump forcing more water through drains than they were designed for has the potential of causing mechanical connections like rubber couplings to come loose. It can also push water out of p-traps allowing waste gases to enter into a home. It should only take about 2 – 3 minutes for a walk-in tub with a single drain and natural vented drainage to completely empty. Bathers usually will use the shower wand to rinse soap off themselves and the tub during this short time. A slow running drain could be caused by any number of things, poor venting, blockage etc. It will have nothing to do with the type of tub installed. BC Senior Safety Services Ltd was established to offer seniors and people with mobility challenges an affordable alternative and knowledge to safe bathing products. We hope the articles written in our blog posts will be helpful, and welcome your input.